It’s simply a term that describes a small piece of a large puzzle that can be defined as a large digital transformation in real estate technology. Over the last few years, PropTech start-up companies in the real estate space have been able offer new products that will ultimately change the way business models are formed when it comes to property management and investing. Like all other technology advancements, the use of PropTech will transform the real estate industry. The real estate industry, which is not known for being on the forefront of technological advancements, is now starting to see the benefits of innovation. These real estate technologies are transforming the processes of buying, selling and managing property. PropTech refers to technology that is aimed at the real estate industry and attempts to change the way we buy, sell, finance and manage property. It is a small part of a wider digital transformation in the property industry and it’s impact will be huge. London-based real estate advisor Savills estimated that the global real estate industry was worth an eye-watering $217 trillion in 2016, of which approximately 75 per cent was comprised of residential property. A recent report CB Insights stated that approximately US$6 billion in venture capital has been invested globally in proptech since 2011, of which 70 per cent was in the last two years. According to a local report by KPMG and Taronga Group’s investment arm Real Tech Ventures, investment into proptech companies will reach $20 billion by 2020. The current proptech industry in the Asia Pacific consists of 179 startups raising about $US4.8 billion ($6.26 billion) in funding since 2013, already taking up 61 per cent of proptech investments worldwide. And proptech funding in the region is forecast to hit $US4.5 billion ($5.87 billion) a year by 2020. What better time for a dedicated Australian Proptech event. 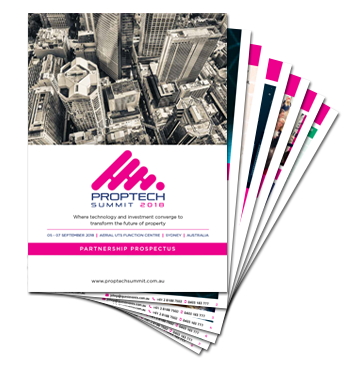 The PropTech Australia Summit will bring together real estate companies, agents, brokers, tech VCs and institutional investors within the proptech ecosystem. The objective is to create an annual forum where real estate decision makers from across the value chain can connect with cutting-edge startups and technology companies to take their business to the next level and build the future of property. What’s happening in the Proptech market globally and locally? What actions do traditional real estate players need to take to survive and thrive? What are the new business models and partnerships being created as a result of PropTech? What are the implications of Proptech on the real estate job market? What are the risks and advantages of collaboration? Where will the growth and opportunities come from in the Australian market?